The Werner Camano Carbon Kayak Paddle is one of the world's most popular kayak paddles for a low-angle paddling style. With its mid-sized blades, it offers the best balance of light swing weight and smooth forward strokes. This is the touring paddle that is best suited for the widest range of paddlers. The easy, two-piece paddle breaks down quickly for transport and storage. The Camo Carbon paddle has a remarkably light swing weight to keep you paddling longer. I would rate this paddle a A+, it is one of the best paddles on the market. Purchased this paddle as an upgrade to my Werner Skagit and what a difference! Super lightweight and extremely durable. Definitely worth the price. I, like most people at first, thought that I would never spend hundreds of dollars for a stick to push water. That was until a friend let me use his and I realized what a difference shedding 3/4 lb. from your paddle makes. Paddling is believing. These paddles were a little more than I wanted to spend. However, I am glad I did. They are very well made and light weight. How can you not like this paddle. It is like night and day when paddling all day in a kayak. Not much more I can say about the quality and what you get from this paddle. As for why I bought it at ACK, again, it is all about price and service. In life, we all know that you will get a bargain once in awhile, of course it is going to happen.........but most times, it is the same ole story.....you get what you pay for, bottom line. Best light and versatile paddle I have ever used and I have owned quite a few. This is my second camano blade. Wow, I never thought I'd pay $330 bucks for a paddle but this is the best money I've ever spent. Using a paddle this light is an incredible experience. Those ounces add up to pounds over and hour and tons (well not quite!) over a day and it rapidly becomes worth it. I watched what all the "big boys" were using for paddles and talked to them and this was the one. As to my relationship with Austin Canoe and Kayak - fantastic folks to deal with! My order was placed, processed, and shipped on the same day and arrived at my house two days later. It was packed in a bomb proof box and padded to the nines. Their followup on my satisfaction with the order is also a surprise to me. I will use them for all my kayak needs in the future without hesitation! 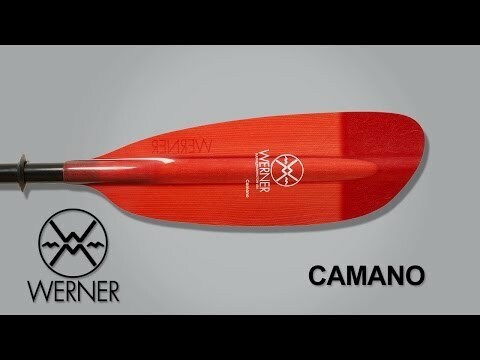 The Werner Camano Carbon Straight Shaft paddle is an awesome product. I'm new to paddling but decided to go straight to the highest rated paddle available rather than upgrade at a later date. This paddle is extremely light and, for me, very easy to use. At my age I need every advantage I can get and manipulating a lighter paddle over a long day of paddling just makes sense. ACK is great to deal with super fast shipping. The paddle is great very light, I have not used it yet, but plan to in the next couple of weeks and can't wait. The fit and finish on the Werner is second to none. I love the amount of adjustment in the feathering. Q: Do you have the Werner Camano Carbon in a one-piece paddle, 240 cm length? A: Yes, we can special order the Werner Camaon Carbon 1 piece. It comes in an adjustable length of 205cm to 260cm in 5cm increments. Q: Is this paddle adjustable? I noticed that you can change the angle so I didn't know if you could change the length. A: No, this paddle only comes in a set length. Q: I am looking for the Werner Camano Carbon Straight Shaft Paddle at 210cm but do not see it on your site. I have seen it on other sites at 220cm and larger as well at prices as low as $280. What do you have available? I am not in a hurry and can wait for Spring to find the best deal. I am also interested in a Werner Cyprus Carbon 210cm. Thanks. A: Unfortunately, we only carry the 220, 230, and 240 cm in the Camano Carbon Straight Shaft. We can special order any paddle Werner makes, so we can order that 210 cm for you.